If you are looking for a cultural adventure, a foodie heaven and one of the greatest destinations of all time, then this is the place to spend your honeymoon. If you are dreaming of a honeymoon to relax on the sandy beaches, then Japan should not be your honeymoon destination since you will be missing all the awe of this country (although I hear it’s home of some beautiful beaches). Japan is a beautiful country with majestic temples and shrines, gardens and national parks embedded within a millennial culture. The food is exquisite, every restaurant and street food is mouth-watering. We went to Japan for our honeymoon in September for 3 entire weeks. (These were one of our longest vacations since we have started our professional lives, crazy right?). After much reading about Japan, we decided to go to Tokyo, Kyoto, Osaka, Nara, Kobe & Hiroshima. Along the way, I will share some pro tips in order for you not to make the same mistakes than we did. At the end of the article you will find practical Information to make your trip smeamless. Before getting into the itinerary, there are a few things to keep in mind for honeymooners. Japanese culture has countless written and unwritten rules, for example, you cannot eat in the train or in public spaces, you can only smoke in designated areas. For honeymooners, showing physical affection is deeply forbidden. If you were looking to kiss, hug, hold hands and show the world your newly professed love to one another, then you better think twice (or do it when no one is around). In Japan, keep your hands in your pockets - or to your camera, you won’t want to miss a snapshot. For westerners, if you are staying in an Airbnb be sure that the room has a real western bed. If not, you will most probably end up sleeping in an uncomfortable futon mattress (mattress on the floor). This happened to us in Tokyo as we had to sleep 7 nights on a very thin futon that you could fold and unfold, very uncomfortable, especially for honeymooners… you have been warned. To celebrate your new union, nothing can be more memorable than to dine at a Michelin-starred restaurant. After all, you will only celebrate your honeymoon once (or at least you hope so). Japan is a foodie heaven and abounds with high-end restaurants that will make your taste buds explode. Tokyo holds the world record for the most Michelin-starred restaurants within a city. Being the culinary capital of the world, you have plenty of options to dine. If dining at a Michelin-starred restaurant is out of your budget (although some are affordable), look for the Bib Gourmand category. This denomination is given to eateries that offer “quality food at affordable prices”. Stayin in a ryokan is probably the best experience that you can have in Japan! A ryokan is a traditional Japanese-style inn. They are mostly concentrated around the Kyoto area, in the Japan Alps and by the coast. These traditional hotels date back from the Edo period (the middle ages that spanned from 1603 to 1868) where they served travellers and Samurais along the Japanese highway. What makes a ryokan special is that they are in traditional Japanese houses and most of the time they are family-owned that are passed from generation to generation and they only have a handful of rooms. These inns are a perfect example of Japanese hospitality. Most of the ryokans have private onsens (hot spring baths) which add to the experience. The rooms are simply decorated and you sleep in tatami matted floors in futon beds. These are very comfortable since they are thick and your comfort is one of the hotel priorities. Upon your arrival, the host gives you indoor slippers and in the room, they will provide you with a “yukata” (summer kimono made of cotton). We stayed one night at the Hiiragiya Ryokan in Kyoto and took a full-board package where the breakfast and dinner were included. Since it was our honeymoon they arranged the meals in the room for us and served the plates in celebratory china to highlight the occasion. The staff makes your beds and puts a little table with two chairs without legs. They usually serve local food showcasing the local specialty. Most ryokans serve Kaiseki Japanese cuisine which is a multi-course meticulously prepared and beautifully presented. The breakfasts were also served into the Kaiseki fashion. Sleeping in a Ryokan can be expensive but it is worth every penny! Just thinking about our experience, it makes me want to go back to Japan. We decided to start our trip in Tokyo and spend 7 days in the capital city. This allowed us to settle into the jet lag and experience the city a little further. The Japanese capital is one of the world biggest and busiest cities in the world. The city perfectly blends history with modernism. 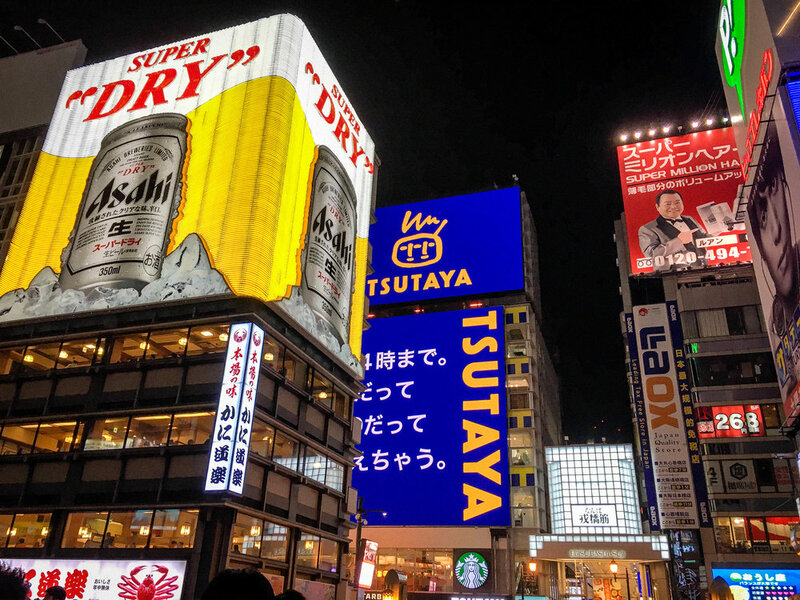 From grand temples, Zen gardens to the busy Shibuya crossing to futuristic skyscraper, Tokyo has it all. To read the full Tokyo itinerary go read my other blog post. There are several day trips available from Tokyo. We did 3 in total, Hakone, Kamakura and Kawagoe. You can also read about these city breaks in my Tokyo post. Renowned for its numerous onsen, beautiful mountains views and parks, this little mountain resort town is a great romantic spot. The mountain town is known to be a couple get away for Tokyoite as it offers outdoor and artsy activities, and of course countless onsen (hot springs). The iconic red torii gates across the Ashi Lake with Mount Fuji at the back is the highlight attraction. Other activities include a panoramic ropeway to enjoy the view from above. There are plenty of onsen scattered through the mountain, perfect to relax after all the walking. Hakone is the perfect couple city break from Tokyo and can be visited as a day trip from the capital. Pro tip: if you have large tattoos, don’t even try to get in an onsen. There is a strict Japanese etiquette rule where tattoos are forbidden in the onsens, even if you are a non-Japanese. If you have small tattoos, you will need to cover them, with a bandage that you can buy on site (we saw them available at two places). This tradition dates back from the Edo period and it is a stand against the Yakuzas, the Japanese mafia. After Tokyo, we decided to spend 4 days in the historical former imperial capital. We spent 1 night in a ryokan and 2 nights in an airbnb. The former imperial capital of Japan offers a few romantic spots. The ancient city is a delight for the history buff and has the perfect mix of urbanization and nature. A very traditional city, you can still see Geishas and people walking in their traditional kimono. Did you know that Kyoto literally means “capital city”? The city has more than 2,000 sacred temples and shrines including 17 UNESCO World Heritage Sites. Perhaps the most well-known temple is the Kinkakuji (Golden Pavilion), the beautiful temple is completely covered in gold leaf. It is believed that the ashes of Sakyamuni (the founder of Buddhism) are stored inside. The Kiyomizu-dera temple which is part of the Historic Monuments of Ancient Kyoto UNESCO World Heritage site has the Jishu Shrine which is dedicated to the deity of love. So go and give it a visit to make sure your love is blessed by the deity of love. Another must-do is the Nijo Castle. The other landmark of the city is the bamboo forest in Arayashima. Personally, I felt that the forest was a little small and it was packed with people. Do walk along the banks of the Kamogawa River and enjoy the scenery with the mountains as a backdrop. To take a break from all the historical sites, wander in the Gion entertainment district which is full of restaurants and coffee shops, this is also the district of the geishas. The Nishiki Market (Nishiki Ichiba) has more 100 different shops with plenty of restaurants and Izakaya. Of course, Fushimi Inari Shrine needs to be on your list! The entrance of the shrine has thousands of torii gates that climb up the many mountain paths for spectacular views. The entrance to the place is free. The base of the mountain is very packed with tourists but as you go up you will see that there are less and less people, so get ready to climb to the top, it is worth your effort! It takes around 3 hours to go up an down. Pro tip: There is an entrance fee to most of the sightseeing and when summed up, it can be quite expensive so do budget well or carefully choose which places you want to visit. We eat at Yamamoto menzo, a Michelin bib restaurant known for their delicious udon. There is always a line but is definitely worth the wait. Next to our Airbnb we discovered a little restaurant called Washoku Shiki (a bib gourmand). The chef (and owner of the restaurant) was extremely friendly and was surprised that tourists went to eat his cuisine. We had a great time chatting with him and his wife through an app that translates Japanese to English. Osaka is the second largest city in Japan and it is full of things to do and eat. We stayed 3 days in Osaka in a rented apartment. Takoyaki : Perhaps the most well-known dish is the Takoyaki, a fried round mixture of batter, octopus, ginger, and usually some vegetables and spices. The recommended places to eat them is on the food stands on the streets of Dotonbori. Okonomiyaki: This plate is a sort of Japanese pancake. However, it is not sweet, it is savoury and it made with flour, egg, cabbage, a selection of other vegetables, and meat topped with mayonnaise, bonito flakes and a brown sauce. Kushikatsu: Another, hearty and fried dish, Kushikatsu is vegetables and meat fried on a stick. There are countless combinations available. Osaka is a very lively city and has plenty of things to do. Kuromon Ichiba Market is a public market where most of the chefs go buy their food, this is a good place to stop and eat. After, you can head to the Osaka Castle, it is one of the most recognizable landmarks, you can either go in or just enjoy walking in the beautiful gardens. 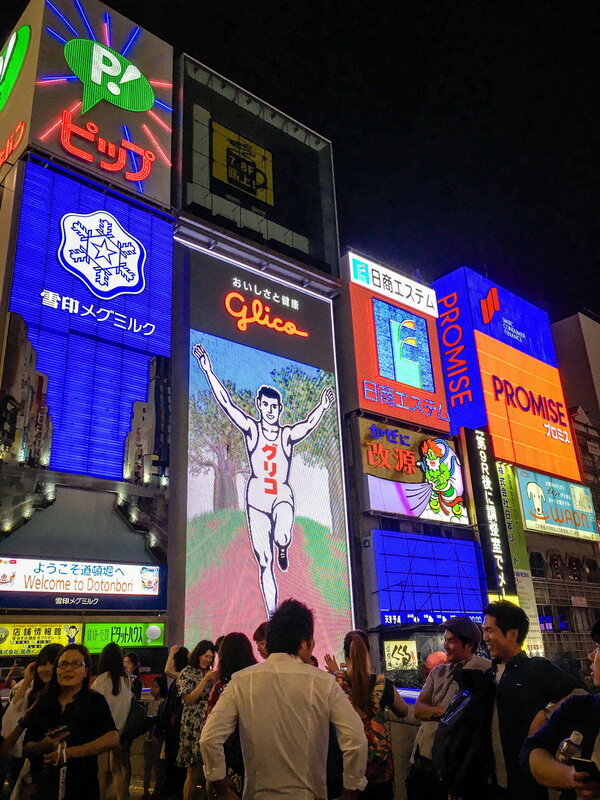 The Dotonbori area is the heart of the city with its sea of neon lights as its main landmark. The area is known for its nightlife and entertainment, a must go to visit this vibrant city. Osaka, like the other cities, abounds with temples, shrines and museums. We decided to visit Osaka International Peace Center, a WWII museum which talks about the hard times Japanese endure during the American raids and the American control after WWII. The museum oddly enough only translated some text, which often omitted the Japanese invasion of the other Asian countries. If you are a whisky lover then this is the perfect day trip from either Osaka or Kyoto. Hop on the train, enjoy the scenery and get your taste buds ready. The award-winning Suntory whisky is in the picturesque base of Mount Tenno. The location gives one of the main and most important ingredients, the pristine water that filters through the bamboo forests. You can either take a paying tour (you need to reserve in advance) through the facilities with a tasting at the end or you can go through directly to the bar. Next to the bar, there is a small museum that talks about the history of Japanese whisky. In the distillery, you will be able to taste exclusive whiskys that are only sold there. The Suntory Yamazaki Distillery is about a ten-minute walk from the JR Yamazaki or Hankyu Oyamazaki stations. Nara was the first permanent capital of Japan in the 700’s AD. This gorgeous town is known for its countless Unesco World Heritage sites and of course the deer. 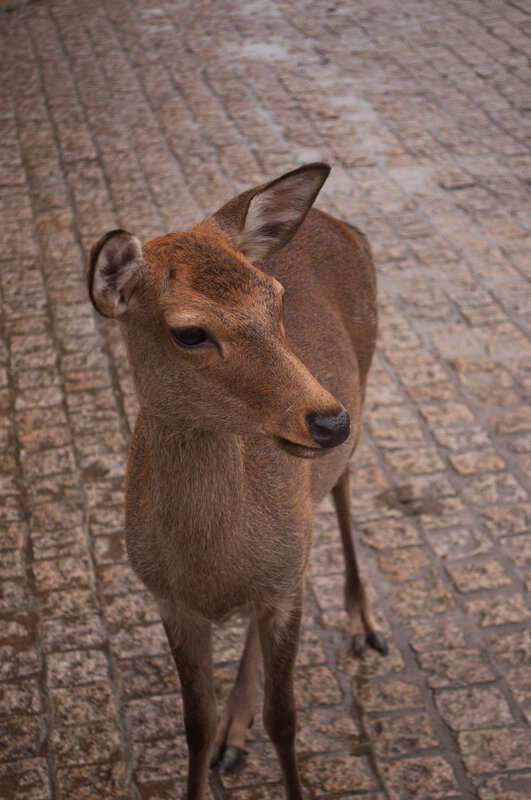 In Nara Park there are more than a thousand deer roaming free. This is definitely the highlight of the city. Heads up, bring treats as they are always hungry! The legend says that the god Takemikazuchi arrived in Nara on a white deer, to protect the newly established capital. Since then, the deer have been regarded as a messenger of god and a divine creature. One of the most beautiful temples of the town is the Todaiji Temple with its bigger than life sculptures. We stayed in this town for 1 night in a rented house. We had the best host that we could ask for, a retiree Japanese man that will take care of you as if you were part of his family. The only reason why we decided to make Kobe part of our itinerary is to taste, the famous Kobe beef! To eat the best steak of your life go to Steak Aoyama on Tor Road. This family-owned restaurant has a homey atmosphere and prepares in front of you a Wagyu beef (the type of beef used for Kobe beef) that will melt in your mouth. This can be the perfect restaurant for you to enjoy as a couple. Kobe is one of the largest port in Japan. To get a view of the city and catch the sunset, take the Shin-Kobe ropeway. While in Kobe, you need to visit the Nada Sake District. The district holds one of the country best sake producing region. The district spans for approximately three kilometers east to west so there is plenty of sake for you to taste. The region’s weather, rice quality and water allow producing the best type of Sake. While you are hoping from brewery to brewery do take the time to visit the museums and to take a tour so you can understand the making process and which sake to choose, you will see that there are plenty of types. You can even have sparkling sake to celebrate your honeymoon! To get to the district with the JR pass you need to get down at the Sumiyoshi Station. Pro tip: Osaka, Nara, Kyoto, Kobe are EXTREMELY close! We made the mistake to sleep in each of these cities which resulted in too many moving. Some of these towns can be easily converted into day trips which will make your trip much more enjoyable. The atomic bomb in 1945 will forever mark the history of the city. One of the first things you should do in Hiroshima is going to the Atomic Bomb Dome. The dome is the only standing remaining building after the blast as it was just a few meters away from the hypo-center. After, take a walk through the Peace Memorial Park and the Peace Memorial Museum. Be sure not to miss the Cenotaph and the Children's Peace Memorial. This can be a heavy day full of tragic history but the city is a recovered greatly and is brightly directed towards a peaceful future. Miyajima island is located just outside Hiroshima, and is the perfect day trip from the city. The island is famous for its torii gate that floats on the water at high tide with mountains on the backdrop. The scenery is one of the most romantic spots in Japan. Visit the temples and the many gardens and then climb the Mount Misen for stunning views from above. Be careful, there are poisonous snakes on the mountain. While on the island, don’t forget to try the oysters, its the local specialty. The ferry to the island is included in your JR Pass. Pro tip: The day of our return trip to Montreal, we left Hiroshima took the tramway then 4 trains (due to our schedule we could not take the bullet train) to get back to the Narita Airport in Tokyo. If you are leaving from the same city that you arrive, I would highly recommend going back 1 day earlier to avoid a crazy commute. Japan is a beautiful destination for honeymooners and it will definitely be a trip of a lifetime! On our part, we have been wanting to go back to Japan ever since. We have decided that it will be our 5-year anniversary vacation. If you are planning to tour the country, you should get a JR Pass. Japan rail system is hyper-developed, with its Shinkansen (bullet trains), metro and train system. If you are planning to go to different cities, it is the cheapest and easiest way to travel. There are several multi-day package options, get the pass that fits your stay better. When you are ordering it, you will think it is a bit pricey but it is totally worth your money. The JR blends seamlessly with parts of the metro system of Tokyo & Osaka so you might not need to buy a subway card for these cities if you are a JR pass holder. You can only get the JR pass outside Japan and it takes a few weeks to arrive so be sure to plan ahead. Also, you need to activate your pass at the airport (or other designated points) upon arrival. When you receive the passes, they will come with a little explanation on how to activate and use them. I would highly recommend not to rent a car. The public transport works very well and you can easily get in and out of the cities and move within the city without any problems. We went at the end of summer and beginning of fall which turns out to be the rainy season. Quite frankly, the worst time ever to visit, it rained almost every day! In all our couple pictures, we have an umbrella in hand, probably not our best honeymoon pictures. The fall with the fall foliage and spring with the beautiful cherry blossom can be the perfect season for you to visit. Also, Japanese culture is very season conscious and the seasons will dictate some of the activities and type of food you eat. We got to try some of the fall harvests as purple potatoes, which are delicious! The currency is the Japanese yen, you can recognize it by the symbol: ¥; and the code: JPY; also abbreviated as JP¥. The Yen can be easly found abroad at the currency exchange office since its the third most traded currency. Japan is mostly a cash based society so you will have to bring lots of cash. Credits cards and debit are not exhaustively accepted in stores and restaurants. The voltage in Japan is 100 Volt. Japanese electrical plugs and outlets are similar to North American ones and you will not need adapters if you are coming from North America.